As I was driving along the A61 from Ripley Castle towards Ripon and turning left on the way and going along a country road that continued in the fields, the ruins of Fountains Abbey came into sight in the woods on the River Skell. Approaching the ruins, I was surprised at the breathtaking magnificent view and the scale of the abbey at first. And I stood still for a while. The beauty of the ruins of this abbey needs no explantion. I heard it is the biggest and the most beautiful ruins in England , even in Europe. I agree with this remark. Then I was surprised again to know this great abbey was ruined suddenly by the action of one man, Henry VIII. It was the neccessity of history, or some quirk of it, I wonder. Fountains Abbey was founded here by the Cistercians in 1132 and completed almost in the mid 13th century. But the abbey continued enlarging afterwards; the extension and remodelling repeated by the early 16th century. The ruins spread about 10 acres. Almost all of the abbey constructions were built in the Norman style, except for the presbyterry, the eastern part of the church, which was made in the Early English style. 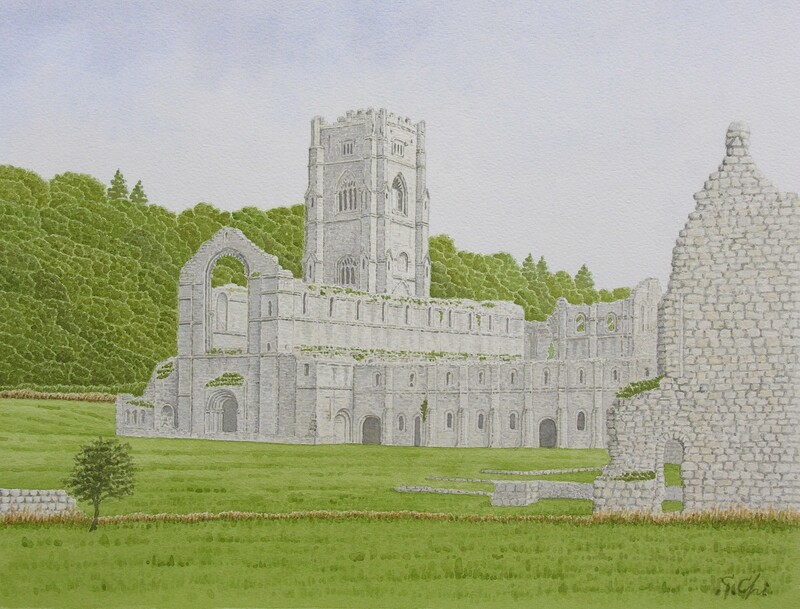 The prosperity of the abbey reached its peak in the 13th century, and it is said that Fountains Abbey became the biggest landlord in Yorkshire, prossessing about a million acres, two thirds of Yorkshire dales. It is amazing that it was possible to travel nearly 30 miles westwards from the abbey without leaving its property. Fountains Abbey had produced the greatest quantity of wool in northern England and had exported some of it even to the continent. Becoming a huge enterprise, Fountains Abbey also mined iron ore in Nidderdale and smelted it in a smithy of the abbey. Further, the abbey did inshore fishing in the North Sea and sold the catch in the fish market of Scarborough. 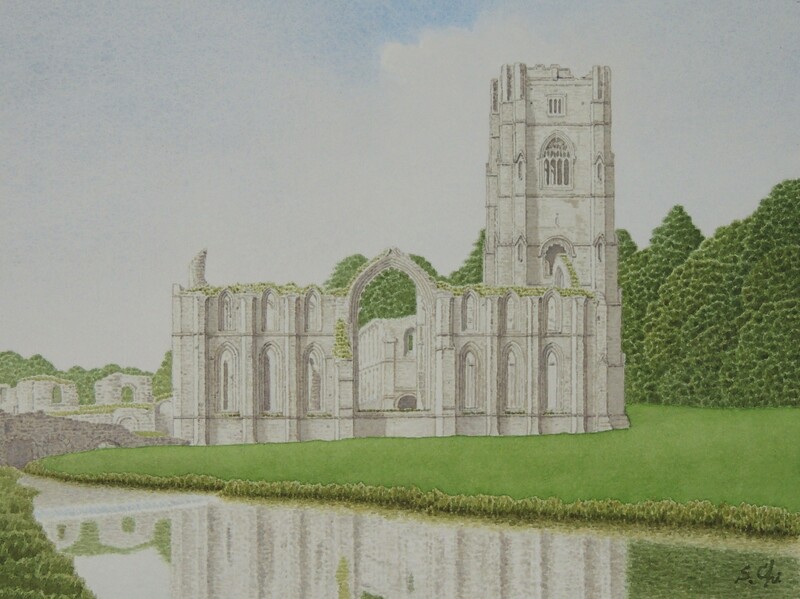 Fountains Abbey was a great religious house, and I can imagine the magnificence of it in its glorious days. I cannot but feel something beyond or unsuitable for the religious life and creeds of apostolic poverty. Also, it is ironical that G. M. Trevelyan, a great historian, referred in his "History of England" to the effect that this monastery was abuused thoroughly for its notorious greed for economic activities by contemporaries. It is true that any part of the world and anytime of the history, huge religious orders have a tendency to become arrogant. Huby's Tower, rising more than 160 feet, was built by Abbot Marmaduke Huby in possibly from the end of the 15th century to the early 16th century. In the early Cistercians, the building of the tower was forbidden. The reason might be the proudly tower was not suitable for religious houses, I suppose. But the wealthy Fountains Abbey got rid of the habit. Having been the symbol of the final glory of the abbey, the tower still symbolizes the old day's prosperity of this abbey. Fountains Abbey, the richest abbey in England, was also dissolved in 1539, closing its 400 years' history, and it was left ruined in the woods. There were more than 1,000 monasteries in England and Wales in the Middle Ages. But almost all the abbeys and priories disappeared under the Dissolutions of the Monasteries of Henry VIII between 1536 and 1539. What a great king he was!